I never knew that making these babies could be so much fun and easy. It makes me wonder why I haven’t made them before. I wanted to try making these with only 4 ingredients, since that was what I had in my pantry. I love the depth of the dark chocolate in this recipe and somehow it makes me feel less guilty eating them. I also made an extra batch of these for my next cookie project. But for now, here is the recipe. Mix together the peanut butter, confectioner’s sugar, cookie crumbs and salt together. Working one at a time, pour a teaspoon of melted chocolate into each mini paper cups. 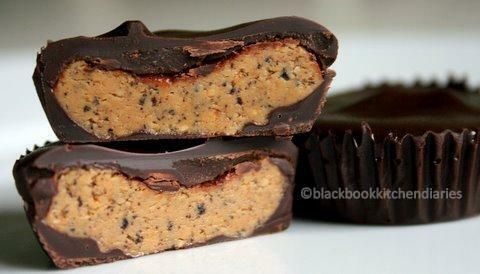 Use a small pastry brush to coat the inside with chocolate, making sure the chocolate is thick and there are no gaps. Place the chocolate-covered liners in the refrigerator to firm up for about 5 minutes. Then fill in with a teaspoon of the peanut butter mixture. Pressing down gently to make sure the paste is evenly distributed. 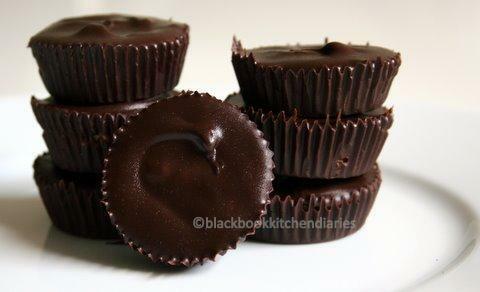 Then cover the cups with remaining melted chocolate, spreading carefully so that none of the peanut butter can be seen. Then, refrigerate until set for 10 minutes. Im truly impressed with ur blog. Im in love with it. Wow! I was impressed with the first photograph, but the second one really got me. How delicious, how creamy! I love chocolate and peanut butter, and I think that the simplicity of these candies/treats is very appealing. Thank you for sharing with us!